Right before 2012 skidded to a halt last week, Russia's space agency's main contractor, RSC Energia, announced that they had completed designs for a new spacecraft to replace the venerable Soyuz, and they'd start test flights in 2017. For space geeks like me, this gave me the warm, welcome feeling of something comfortingly familiar. Familiar, and with a pretty good chance of never gonna happen. See, announcing the replacement the world's most reliable and successful spacecraft has been something of a hobby for the Russians (and previously Soviets) since the 1970s or so. And, so far, nothing's ever come close to stopping the funny green insect-like Soyuz, which has been flinging duos and trios of cosmonauts to orbit and back since 1967. Here are all of the major design proposals that never were. The problem RSC Energia has is oddly similar to the problems Volkswagen had in the early 1970s. They make a product (Beetle for VW, Soyuz for RSC Energia) that's become an icon, and, while it's been updated to generally keep with the times, it's based on a many decades-old design. And competition is starting to get pretty intense. For VW, that meant good, cheap small cars from Japan (Honda, Datsun, Toyota), and for the Soyuz that means America's new Orion orbital-and-beyond system, as well as the Dragon capsule from SpaceX (and possibly other private companies) and China's Shenzhou Soyuz-derived spacecraft. Volkswagen had many failed attempts to replace the Beetle, including the Type III, Type IV, the Brasilia, and some very interesting prototypes. All failed at their goal of replacing the Beetle, until VW bought NSU, which gave VW (and then Audi) their water-cooled FWD models that eventually became the Golf, which saved VW's schnitzel. RSC Energia needs their Golf. So far, the Soyuz is plenty safe. It's still by far the cheapest (that's why the US Shuttle was never really a competitor) and most reliable way to get humans in space. Yes, it's very cramped, can't carry much cargo, and is still (currently) limited to low earth orbit, but for now it still just works too well. This one only partially counts since it was more of a competing initial design project when Soyuz was still being developed. It would have had a re-entry capsule with essentially the same 'headlight' shape as the Soyuz, but was 50% bigger. Eventually, the Sever development was merged into Soyuz, but some fundamental Sever concepts (the sophisticated 'make it bigger' method) do show up again. If anything should have replaced the Soyuz, it was this. The TKS system offered some real advantages over the general Soyuz configuration, mostly in terms of usable, habitable space. The thing was pretty huge. It had a very Apollo-like conical re-entry module docked to a large, almost space-station like cylindrical orbital module that contained the docking ports and orbital maneuvering engines. An interesting design detail was that the Merkur return capsule (the conical, reentry bit of the TKS) had the hatch to the orbital module cut into the heat shield at the rear. This sounds scary, but the Soviets tested and launched these things extensively (unmanned) and the heat shield hatch was never an issue. Though never actually used as a Soyuz replacement, the TKS modules, usually minus their return capsules, did find a lot of use as the basis for most of the add-on modules to the Mir and even the ISS. In fact, the first part of the current ISS and still in use today (though mostly as a closet/private space-masturbation zone) is Zarya, a TKS-derived module. Remember I said that the basic Sever concept of a bigger Soyuz would come back? Well, here it is. Zarya was exactly that— take the basic, proven headlight shape of the Soyuz reentry capsule, scale it up like crazy, and cram all systems in there. The result was a SuperSoyuz that could hold up to twelve Cosmonauts on two decks or a spacecrapload of cargo. Landing would have been accomplished with a large ring of solid braking rockets, and while that would have been awesome to watch, there were "acoustic environment" issues (I'm picturing 24 bleeding ears in tests) and no good backup in case any of the landing engines failed. I think this one is my favorite. This proposed replacement got to a pretty advanced stage of development, with all kinds of exciting mockups built and drawings made. And it's clear why — of all the Soyuz replacements, this is the only one that really feels like something totally new. Though, that is a bit deceptive, in that it's also the only one to incorporate a significant part of the old Soyuz hardware as well. Essentially, Kliper is a small space plane, sort of like a scaled-down Space Shuttle. It uses the now-familiar black-and-white reentry tiles like Buran and the US shuttle, and has a sort of lifting-body shape NASA has been experimenting with since the 1960s. It also looks a lot like the mini-shuttle used in the Simpsons episode where Homer was an Astronaut. I never knew why they didn't just have him in a regular US Shuttle, but what the hell. Kliper would hold six Cosmonauts and much more cargo, and be mostly reusable as well. One of my favorite parts of the design was that they used a slightly modified Soyuz Orbital Module, ringed with thrusters, at the rear. This is the spherical, top part of the Soyuz and has extra room, the toilet, docking equipment, and can act as an airlock. By incorporating this element Kliper would have been able to dock with any spacecraft the Soyuz can dock with, and gain an airlock, all with an already proven component. Clever! So the Russians came to the Europeans for money and partnership for Kliper in 2005, and the Europeans balked at how expensive all this Buck Rogers crap is. So, with economy in mind, the Russians and Europeans came up with a super-cheap but much more capable Soyuz, one that would allow for not just Earth-orbital but lunar missions as well. They did this by slapping a Fregat orbital tug to the back of the Soyuz to give it the extra fuel and oopmh needed to get to the moon. New heat shield designs would be needed as well to withstand reentry from lunar distances/velocities. I think this would have worked, but it is maybe just a little too cheap. And it'd still be cramped, just now for longer and farther away. These tedious-looking acronyms stand for Crew Space Transportation System (a nice long way of saying "spaceship") and Prospective Piloted Transport System. Awful, awful names. These could be divided into two separate replacement attempts, but they're really part of the same project, so we'll keep them together. The initial CSTS design was a joint Russian-European one, and comes closer to a modernized Soyuz than anything. It keeps the Soyuz three-module layout: orbital module (think space camper), reentry module (the part that returns to Earth), and service module (power, engines, etc.) but with modernized components, largely based on ESA's ATV cargo ships used to resupply the ISS. This basic three-module design is actually one of the reasons for the Soyuz' longevity. It allows for maximization of usable space and flexibility while keeping mass/weight low. See, for any module that you want to return to Earth, you have to build it to withstand reentry, an atmosphere, and all that adds weight. And then you have to be able to safely land all that weight with parachutes or whatever. By moving anything that doesn't need to come home to a disposable orbital camper module, you save weight and fuel while keeping the amenities. That's why Soyuz had almost double the habitable volume of Apollo with much less weight. Of course, this is such a good idea that the Russians and Europeans abandoned it in the current revision, and nobody else (US, private companies) is using it at all. Oh, except the Chinese, who've expanded on it with their Shenzous. So, the latest version of the proposed Soyuz replacement, the one everyone was talking about in late December, is a two-module system, much like Orion or the old Apollo CSM. It's a conical orbital/reentry module capable of holding 6 crew, and can swap service modules to allow it to conduct orbital, lunar, or beyond-lunar (Mars, maybe?) missions. The return module would likely be reusable, and while the fundamental design seems solid, I wouldn't hold my breath for this one, either. It's too close to SpaceX Dragon or the US Orion. 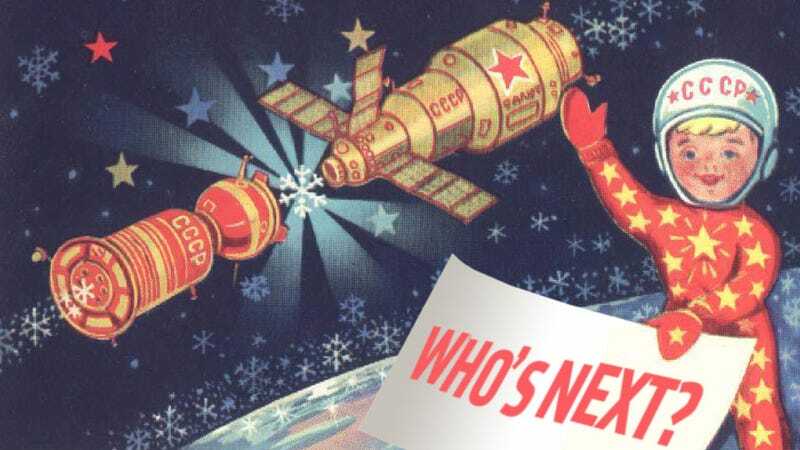 They'd be giving up the two biggest draws of the Soyuz — reliable and cheap — and not getting enough back. Hardigree warned me against harping on this, but I gotta come back to the VW analogy. Reliable and cheap kept the Beetle in production way longer than anyone believed it could. The Soyuz is the same way. And the only way out of the trap of eventual obsolescence is with a radical change. For VW that was the FWD and water-cooled Golf/Rabbit. The Russians need to find their Golf, and it needs to be something radical. Inflatable modules? Ion drives? I'm not sure. Perhaps this almost-Orion could do it, if they can manage to keep the costs low enough. Either way, I'll be sorry to see the Soyuz finally go, which at this rate I'm predicting will be around when teleportation just makes physical travel silly.